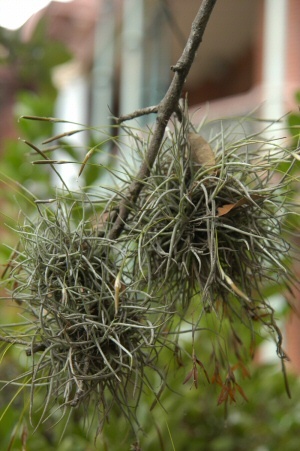 Ball moss (Tillandsia recurvata) is not a moss but a bromeliad, related to pineapples and the beautiful plants we use indoors. It is not a parasite but instead gets its nutrients from the sun and rain. It only hurts trees with heavy infestations but can be controlled easily by spraying baking soda or potassium bicarbonate at ½ cup per gallon of water. The same uasually works on Spanish moss. Like mistletoe it does tend to attack trees as thier health declines and the canopy thins. Ball moss is a parasite that only hurts the tree in heavy infestations but can be controlled easily by spraying the tree with a commercial product called Bio Wash (add 1/4 cup of baking soda or potassium bicarbonate per gallon of spray). ANSWER: At the very least, the presence of Spanish moss indicates a weakened tree. As the tree’s foliage thins, the moss grows thicker. That, in turn, inhibits new growth by the tree. Use my Sick Tree Treatment, which begins with exposing the tree’s root flare. Physically remove as much moss as possible and spray the tree with a commercial product called Bio Wash (add 1/4 cup of baking soda or potassium bicarbonate per gallon of spray).